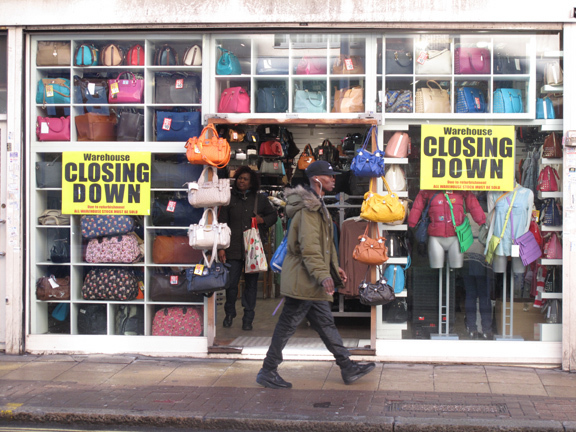 This shop on Rye Lane has been closing down for as long as I can remember. It must be in excess of 10 years. It’s like a Frank Sinatra farewell tour. Of course, it’s a plea for attention: I may not be here tomorrow, so shop today. But shoppers know this is a case of crying wolf in order to shear the sheep. (A metaphor too many?) One day, though, it will come true. This entry was posted in Peckham, Photography, Rye Lane, street photo, Writing and tagged closing down, farewell, Frank Sinatra, Rye Lane shops, street photo. Bookmark the permalink. ← Was it used as a ball?